Simmons Model 201060 02-120 Crib Part Search! I have a Simmons crib that is approximately 12-13- years old. The MODEL number is 201060 02-120. The part that I am looking for is the small plastic piece on the side of the adjustable rail. The little part has been broken and I have no idea where I might find a replacement for it. Go here to see the plastic replacement parts for a Simmons 201060 that are available. If anyone has any suggestions where I might order this plastic piece, please send them to me with links if possible using the form below (including your contact information should I need to get in touch with you). 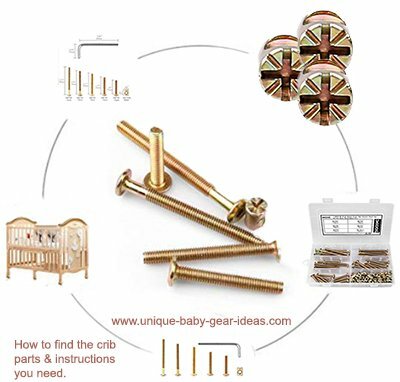 Unique Baby Gear Ideas encourages our visitors to share information regarding Simmons crib replacement parts, safety recalls and reviews of cribs they own or have experience with to make others aware of problems associated with various models, styles and brands.